BEVERLY HILLS, CA--(Marketwired - December 15, 2015) - Genius Brands International "GBI" (OTCQB: GNUS), a global brand management company dedicated to providing entertaining and enriching 'content with a purpose' for toddlers to tweens, and NCircle Entertainment announce the release of the first DVD from Thomas Edison's Secret Lab, a new original animated series that shows kids how much fun science can be. The DVD debuts December 15, 2015 at Walmart stores nationwide, as well as digitally on iTunes, Amazon, Google Play and Hoopla. The announcement was made today by Andrew Berman, Senior Vice President, Global Distribution Sales, GBI and NCircle's Vice President, Sales, Content and Acquisitions, Mary Flynn. "This new comedy adventure series, which is currently available on Comcast, public television stations across the U.S., and more than 60 countries around the world, is a wonderful way for kids to discover how much fun science can be," said Berman. "Together with NCircle, we are making the series readily available to kids in all formats." "NCircle Entertainment is extremely excited to release Thomas Edison's Secret Lab in the U.S.," states Flynn. "This is a perfect title for our library and furthers our goal of providing entertainment that educates to our consumers." 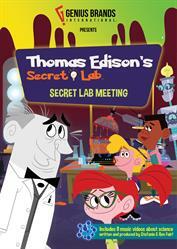 In the "Secret Lab Meeting" DVD (90 minutes), join Angie and friends as they deal with everything from viruses to elements to dinosaur fossils and more! When a virus turns JD into a donut-craving zombie, Angie has to come up with not only a cure, but an inoculation against the virus. Fortunately, Jonas Salk, well-known medical researcher and virologist, can help Angie! Then, during a sailing trip, Von Bolt begins to malfunction, endangering ALVA and Edison, so the Secret Lab Kids investigate elements, compounds, and alloys to diagnose the problem. The news of the DVD launch follows the recent announcement from GBI regarding the U.S. clearance of Thomas Edison's Secret Lab on 161 public television stations across the country. The series, which began its initial launch in September, is now airing in key markets nationwide, including New York, Los Angeles, Washington DC, Atlanta, Houston, Miami, Cincinnati, Jacksonville, New Orleans and more. The series will continue its rollout through the end of this year and into Q1 2016. Early results have shown strong ratings growth in the key markets of Los Angeles (airing on KCET on Sunday mornings with nearly 200,000 viewers over an initial six week period), and the sponsor stations of Georgia Public Television. Thomas Edison's Secret Lab series is also currently available on the new Kid Genius channel on Comcast's Xfinity on Demand platform (NASDAQ: CMCSA), reaching 21 million households across the U.S. and Canada, as well as in more than 60 countries around the world. GBI and interactive media partner, FatRedCouch, also recently announced the launch of the first mobile app for Thomas Edison's Secret Lab, which is available for iOS and Android. The Thomas Edison's Secret Lab app captures all of the excitement of scientific experimentation and discovery while encouraging kids to use their imaginations and creativity to investigate, explore and unlock scientific wonders. And in November, GBI and Ovation Brands® portfolio of family restaurants partnered to create free, fun, interactive family activities based on Thomas Edison's Secret Lab while dining at participating Ryan's, HomeTown Buffet, Old Country Buffet and Country Buffet restaurants across the country on Thursday evenings. The promotion also included a national Thomas Edison's Secret Lab sweepstakes. Additionally, the Company is gearing up for a 2016 merchandise launch with master toy partner, Wicked Cools Toys, who will bring to retail an engaging line of STEM-based toys including compounds, activity kits, science kits, food sets, figures, play sets, novelties and role play products, which encourage kids to explore and have fun with science, inspired by Thomas Edison's inventive spirit. GBI also plans to unveil new games, activity kits, apparel, publishing, and an in-school curriculum program in 2016. Thomas Edison's Secret Lab is a fully immersive, multimedia property that crosses a variety of platforms to entertain. Thomas Edison, the most prolific inventor of our times, is back! This time to inspire a new generation of kids by showing how much fun science and exploration can be in Thomas Edison's Secret Lab. Featuring comedy, adventure and hijinks, the series encourages kids to explore the limits of their own imaginations with the help of Thomas Edison, who returns in holographic form to inspire and encourage them. The series follows 12-year-old prodigy Angie and her science club who accidentally discover Thomas Edison's last invention -- a secret lab with every imaginable gizmo, including a virtual reality machine, Kafloogalator, and a half-finished robot named Tobor who the kids bring to life. Following a STEM-based curriculum, the kids embark on scientific endeavors -- past, present and future. Each 26 half-hour episode in season one ends with a School House Rock-style music video that features original music by Grammy Award-winning producer Ron Fair (Christina Aguilera, Mary J. Blige, the Black-Eyed Peas, Fergie, Lady Gaga, The Pussycat Dolls) to reinforce the learning and the fun. Thomas Edison's Secret Lab was developed in collaboration with an academic team led by Professor Emeritus Don Roberts of Stanford University and Dorothy Singer of Yale, who have overseen the development, as well as the episodic content to ensure it meets E/I (educational and informational) standards. Thomas Edison is voiced by American singer, songwriter and Berklee College of Music Professor Livingston Taylor. Emmy-nominated writer Steve Banks (SpongeBob Square Pants), wrote the pilot episode; Grant Moran (Word Girl, New Adventures of the Magic School Bus) and Betsy McGowan (Senior VP Kids' WB!, co-creator Camp Lakebottom) are co-story editors; Emmy Award-winning Michael Maliani (Madeline, Where on Earth is Carmen Sandiego) serves as co-producer and director; Kevin O'Donnell is the series co-creator; and Emmy Award-winning Mark Young (All Dogs Go to Heaven 2, Tutenstein) serves as co-producer. Headquartered in Beverly Hills, California, Genius Brands International, Inc. "GBI" (OTCQB: GNUS) is a publicly traded global brand management company that creates and licenses multimedia content for toddlers to tweens. Led by award-winning creators and producers, GBI creates "content and products with a purpose," providing enrichment as well as entertainment. The Company distributes its content worldwide in all formats, as well as a broad range of consumer products based on its characters. GBI's portfolio includes award-winning Baby Genius, recently re-launched with new entertainment and over 40 new products; adventure comedy Thomas Edison's Secret Lab, available on public television stations and GBI's Kid Genius channel on Comcast's Xfinity on Demand platform reaching 21 million households; animated movie Stan Lee's Mighty 7, the first project from Stan Lee Comics, a joint venture with Stan Lee's POW! Entertainment and featuring an all-star voice cast led by legendary Stan Lee; and Warren Buffett's Secret Millionaires Club, created with and starring iconic investor Warren Buffett. The Company is also producing a new animated preschool series based on Llama Llama, the NY Times bestselling children's book franchise; and a tween adventure series Space Pop, featuring original music from renowned industry veteran Ron Fair and his singer-songwriter wife Stefanie Fair. GBI's wholly owned subsidiary A Squared Entertainment is a brand management and licensing company that represents third-party properties across a broad range of categories in territories around the world. The company currently represents Psycho Bunny, a luxury apparel line; From Frank, a humor greeting card and product line; and Celessence Technologies, the world's leading microencapsulation company. For additional information please visit www.gnusbrands.com. Genius Brands International (OTCQB: GNUS) and NCircle Entertainment release the first DVD from Thomas Edison's Secret Lab, a new original animated series that shows kids how much fun science can be. The DVD debuts December 15, 2015 at Walmart stores nationwide, as well as digitally on iTunes, Amazon, Google Play and Hoopla.